**** Chosen by Winner: Erik J. File photo. Spalted Birch in actual knife will differ from that shown. The Mnandi balances an all-business approach to design with tasteful aesthetic sensibility. With its sleek 2.75" CPM S35VN Stainless Steel blade finished with a fine hollow grind, the Mnandi is ready to tackle any task you might need it for with style. Its high-quality 6Al4V Titanium handle is built to last and has hand satin finished flats. The Mnandi is made from the finest quality titanium alloy, the Mnandi's integral lock is sure to endure through heavy use, exposure to the elements and heavy use. 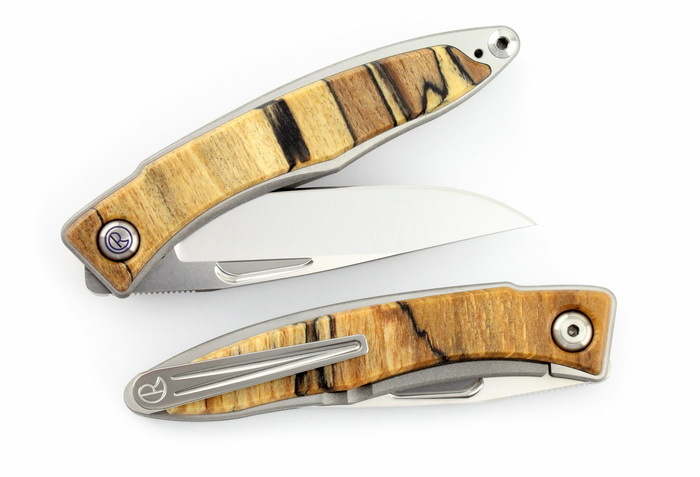 The highly figured Spalted Beech wood inlay adds to the aesthetic appeal of the knife even further, and everyday carry aficionados are sure to appreciate the balance between appearance and functionality. Measuring in at a mere 3.25" folded and 1.5 oz., this knife is compact, even for a folding knife. With so much toughness, reliability, and good looks built into it, the Chris Reeve Mnandi is a difficult one to pass up. Equipped with a pocket clip machined from the same 6Al4V Titanium used in the handle. Chris Reeve Knives began operations on January 1, 1984 in a one car garage in Durban, South Africa, when Chris changed his life from full time Tool and Die Maker/part time knife maker to full time knife maker. For a couple years he was the only employee but gradually and steadily, the company has grown to reach its present position as a well equipped manufacturing company and a noted brand in the industry. The road from 1984 has not always been smooth. For many years, the endeavor was under-funded but with determination Chris and Anne put all they had into producing the best knives possible, within the resources available. In March 1989, they moved from their native South Africa and settled in Boise, Idaho. That move in itself was a major undertaking but vital for the future of the company. Chris has always “pushed the envelope”. Whether on a motorcycle or behind a belt grinder, he dreamed of being a world champion. He did not win a motorcycle world championship but in many respects, the standing of CRK today represents one. His induction into the Cutlery Hall of Fame in June 2015 could be considered his championship trophy. The single thought in Chris’ mind has always been to design every model with deliberation, taking into account how the knife works, its intended purpose and the most appropriate materials. On this foundation, CRK now enjoys a worldwide reputation for outstanding design, exceptional execution, and the closest tolerances in the industry – all backed by excellent customer service. CRK is a vibrant business, has a great staff of well trained employees, and remains a company with a worldwide reputation for raising the standards bar – “pushing the envelope” – for the industry.